Well I was sort of hoping to have another birthday on the 1st but I don’t think Acelyn is ready today. His dad’s and mine are both on the 1st of a month. My due date according to the hospital is the 9th, and according to my OB’s Office is the 11th. I’m kinda nervous about my next appointment (Monday) since at my ultrasound last Tuesday was told Ace is pretty much smooshed without much amniotic fluid left and what is there is only on my left side. It is typical for babies to gain a half pound each week late third trimester and if that’s the case he’ll have no room! 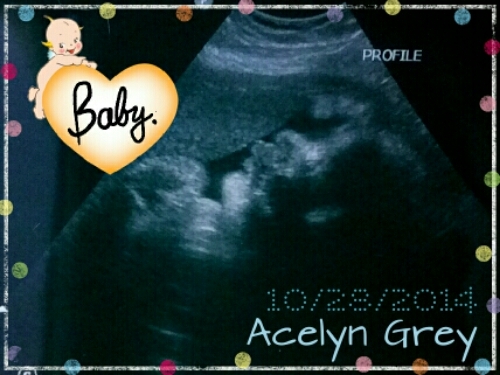 On 10/28/2014 Acelyn Grey was measured at 8.3 lbs with 131 heartbeats per minute! He stuck his tounge out at us too!!! The bassinet was finally delivered today and my mom helped me assemble it. My boyfriend and I have the new room nearly ready! I need to hang up the amazing Oz Nursery art my friend made for my baby shower! I also need to fold and sort Ace’s [tons of] clothes, wash his bottle sets, and put together his bouncers, swing, and tummy time activity gym, plus my boyfriend is installing his carseat tomorrow! I’m a little concerned about my cats playing with his things … they aren’t really shedders but I still don’t want to have to worry about allergens when he’s a newborn. I grew up with two cats that snuck in my crib for naps with me though and I’ve never had respiratory issues or animal allergies so I’m sure it’ll be fine. Between an all-day migraine and terrible acid reflux I haven’t accomplished quite as much as I would’ve liked today. I need to finish washing his tiny clothes so I can finish packing my hospital bag! This entry was posted in Pregnancy Journal, Third Trimester, Ultrasounds and tagged first pregnancy, first time mom, third trimester. Bookmark the permalink.